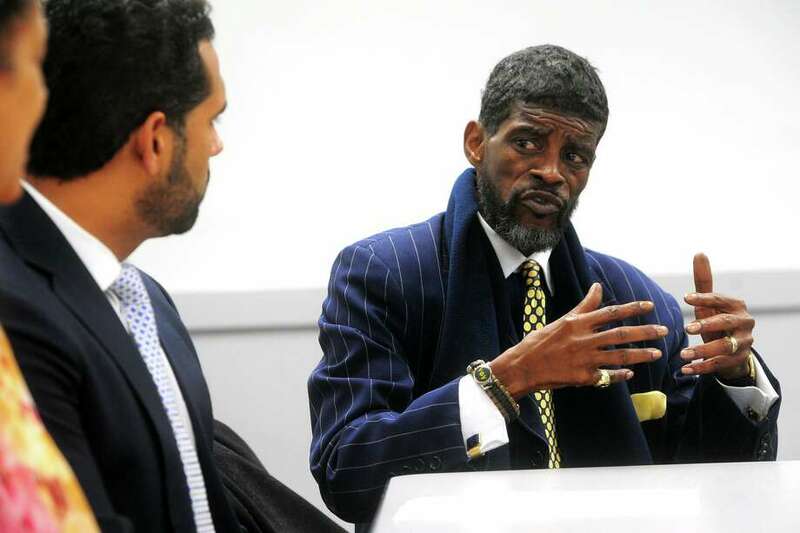 City Councilman Ernie Newton speaks at a press conference at the Bridgeport Public Library, in Bridgeport, Conn. Feb. 25, 2019. Local legislators and educators spoke about a plan to introduce a bill aimed at putting more teachers of color in front of an increasingly diversified student body. BRIDGEPORT — Some City Council members hope to claw back scheduled 4 percent raises for the mayor and his politically appointed hires. Newton said the total amount of wage increases should be subtracted from other areas of Mayor Joe Ganim’s proposed 2019-20 budget that is currently being reviewed by the council. “That would probably be the only way you could look at doing it,” Newton said. A public hearing on the budget will be held Thursday at 6 p.m. at City Hall, 45 Lyon Terrace. The council indirectly authorized the raises for Ganim and his non-union department heads and aides — many of them political allies involved in his mayoral and gubernatorial campaigns — by approving a new contract for the Bridgeport City Supervisors Association over the winter. A local ordinance dating back to the 1990s requires non-union positions receive the same raises as unionized supervisors. Because the supervisors, as part of their just-approved-collective bargaining agreement, received a retroactive 2 percent boost and are scheduled for another in July, that 4 percent total pay increase is reflected in Ganim’s draft budget as of July 1. So as of that date, Ganim, for example, would earn a base salary of $152,855 — $5,935 more than currently. Though angry about the raises, Newton is in an awkward position. He co-chairs the council’s Contracts Committee that voted for the supervisors contract on Feb. 21. The full council, all Democrats like Ganim, subsequently passed that pact, without discussion, at its March 4 meeting. According to the minutes from Feb. 21, Janene Hawkins, the city’s head of labor relations — and a raise recipient— appeared before the Contracts Committee but did not mention the financial impact the supervisors contract would have on the mayor and his appointees. Nor was she asked. Newton argued that, though he was on the council in the 1980s, he was off that legislative body by the time the ordinance was enacted connecting the unionized supervisors’ wages with their non-union peers. And while a similar controversy about wages for the mayor and his aides erupted in 2015, during the transition between outgoing Mayor Bill Finch and Ganim, Newton was not re-elected to the council until 2017. Other newer council members, including Viggiano and Councilman Peter Spain, a frequent critic of Ganim, said they, too, were in the dark about the impact of the supervisors’ collective bargaining pact. Spain said he would support Newton’s efforts to impose cuts elsewhere in the mayor’s budget to make up for the raises. And Viggiano said no one from the Ganim administration mentioned the higher wages during recent budget discussions. Still, the pay increases for the mayor’s political appointees are not as high as they could be, according to Bridgeport’s municipal salary scale, which provides minimum and maximum ranges for dozens of non-union jobs. And while Ganim, as the head of Connecticut’s largest city, with his 4 percent raise would earn more than Hartford Mayor Luke Bronin ($147,634) and New Haven Mayor Toni Harp ($134,013), he lags far behind Stamford Mayor David Martin. Martin’s proposed 2019-20 budget will boost that position’s salary 3.6 percent from $175,661 to $182,066. Councilwoman Jeanette Herron, who co-chairs the Contracts Committee with Newton, said she was fully aware that the raises for the supervisors would also be provided non-union staff. “People who work deserve to have a cost-of-living raise,” Herron said. Per the supervisors contract, union members and the mayor and his staff will also receive 2 percent pay hikes in 2020 and 2021 and a 1.25 percent increase in 2022. Ganim is up for re-election this year. Herron noted the council last year fought “raises we didn’t know anything about” for a selective few on Ganim’s payroll.